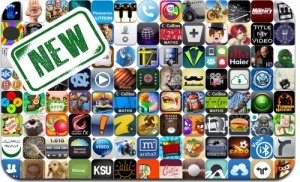 iOSnoops is constantly on the lookout for new apps, and here are 115 iPhone, iPad and iPod touch apps released recently. This new apps alert includes Fruit vs Veg, NinjaGo, Gopher Madness, Centrifeud, Jumping Horses Champions, PuppetShow: Souls of the Innocent, Season Match 2, Magic Encyclopedia: First Story, Weird Park, Trucks in Town, and many others. Ride – Go anywhere and get rewarded.